Christmas Gift 2 is another healthy homemade Christmas gift recipe again by Courtesy of Terry Rodman. Pomegranate has antioxidant properties and is full of vitamins. Not only that, it is deliciously refreshing to eat. 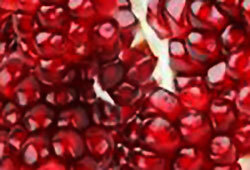 Pomegranate jelly can be used in place of cranberry jelly on turkey. So give a gift of good health-giving pomegranate jelly this Christmas. 1 box of sure Jell for each batch. I find mason jars (easily available in most places) very convenient to use for this purpose. And if you are squeezing your own pomegranates for the juice, you might want to use a juicer. I find the Tupperware JUIST (not an affiliate) very convenient to use. 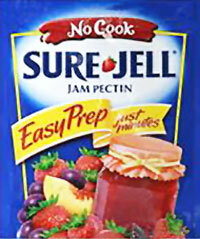 Sure Jell (above) is a simple fruit pectin products that’s used for making jellies or jams at home. Follow the instruction inside the box of sure jell. Just use my measurements. Helpful hints : a lightweight pan seems to work best as it heats fast and starts to boil faster than a heavy one. This makes cooking time faster. The longer you cook or boil the sure jell the faster it starts to break down. It is still good but sometimes does not set nicely. The important thing is to follow the instruction for a rolling boil and timing it after you add the sugar and bring to a boil again for 1 minute. Place your jar lids in a medium saucepan and boil them to sterilize them. I just run my jar through my dishwasher with high heat. If you do not have a dishwasher, you need to wash and then boil your jars and set on a towel upside down to dry. THIS MUST BE DONE BEFORE YOU MAKE THE JELLY. The jelly needs to go immediately into the jars when cooked. It is not hard at all so don't worry. Just take your time and read your instruction before you begin. Measure out all ingredients first and set aside. This will help a lot. Your friends will surely love this Christmas Gift.